Where's your debit card? I can't find anything to play with. I have some online shopping to do. Those toys behind Willow are so last century and definitely not fit for a classy, with-it bun, which Willow definitely is. What he's got in mind is more along the lines of a Quadcopter camera drone to keep an eye on us and a Super-Soaker Thunderstorm Blaster water gun in case of bun-chore failures. Valsainte, I think Willow is a drone. Without your comment I wouldn't have been able to put my finger on it, but while I was carefully peeking at Willow I was searching for a word. Who could blame Willow for needing to resort to some SERIOUS retail therapy after having to endure hoomins?! 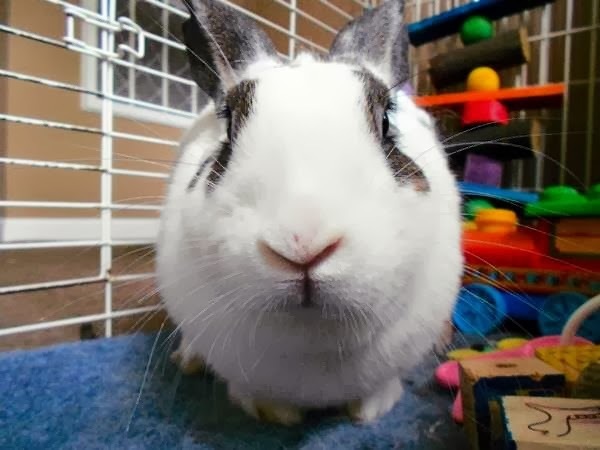 I expect a few large consignments of favourite greens, Scooter Snaps, craisins, bananas, and of course Carrotinis would make Willow feel a whole lot better! Now where did that hoomin put The Flexible Friend? Willow will sniff it out and be online, filling in home-delivery shopping orders in a matter of minutes. And if the hoomin complains they have no money left, well, they'd better go and get a night job too, to be able to afford to fund Willow's lifestyle! Sorry Willow-bud. The bunns here already polished off the last cent in it. WILLOW : withering incoming lagamorph looks over world. Rachel, I am pretty sure "gotcha day" means something different to Willow and all who have encountered her. RG, sure. I think you are the RG who can afford REI socks. Willie of "Willie and Fred"
Fred of "Willie and Fred"